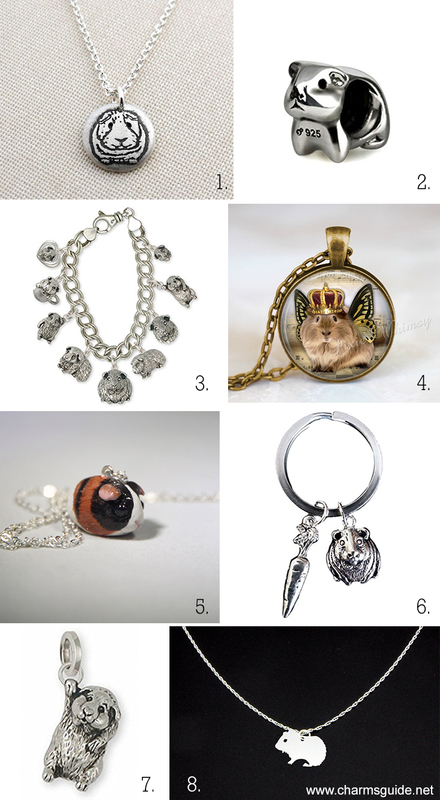 In honor of March being Adopt a Guinea Pig Month, I thought we’d do a post featuring Guinea Pig charms and pendants. I love guinea pigs, they are so adorable, friendly and personable. It’s so cute how they start “talking” to you with their little squeaky happy guinea pig sounds as soon as you walk into the room, and how they sometimes jump straight up in the air (called “popcorning”) when they are excited or happy. Guinea Pigs, whose scientific name is Cavia porcellus, (also often called Cavies) originated in South America where they were domesticated around 5000 BC (although not so much for their cuteness but as a food source). The Peruvian Moche people worshipped them and often depicted them in their art, and statues of Guinea Pigs dating back to 500 BC to 500 AD have been found in both Peru and Ecuador. They made their way to Europe in the 1500s where they became popular pets; Queen Elizabeth 1 of England was very fond of them. Today, they are popular all over the world, and it is estimated that there are around 3.5 million guinea pigs kept as pets in the US. Unfortunately, many of those pets end up in shelters for a variety of reasons – changing family and living situations, unplanned guinea pig babies, lack of time, failure to understand the extent of the commitment of owning a pet before getting one, etc. It is such a shame, because guinea pigs really are wonderful pets, quite low-maintenance, and so much fun. 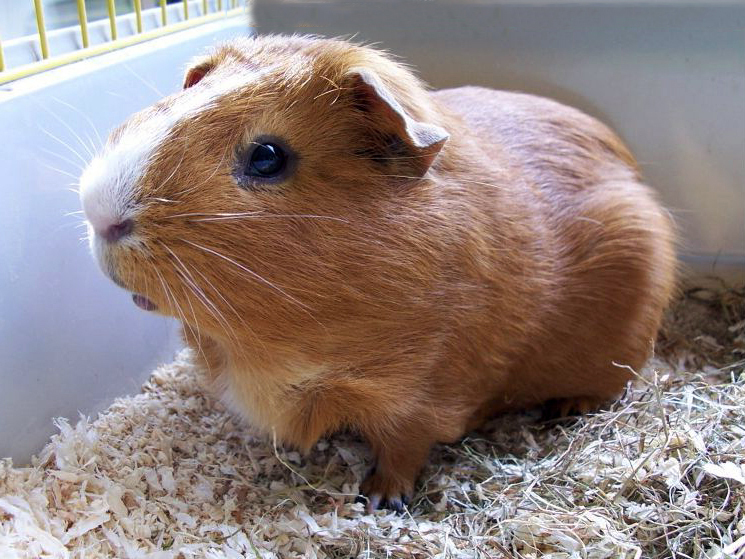 Typical guinea pig life expectancy is around five to seven years, although they can live longer, and they are very social animals (they live in large herds in the wild), so if you consider adopting, please don’t get just one, your cavy needs a friend. They will need a large cage with a solid floor to live in, toys to play with and a house to hide in, bedding to sleep on, and lots of time to exercise outside of the cage. Their diet should consist of lots of top quality hay, pellets especially made for guinea pigs, and a variety of vegetables, especially those that contain a lot of vitamin C. Like us humans, guinea pigs do not produce vitamin C on their own, but still they need it for their survival. 1. Sterling silver necklace with an adorable tiny charm. You can add a small heart charm, name tag or initial pendant as well, and it comes in a gift box. Handmade guinea pig charm by California artist Sue of Lulu Bug Jewelry. 2. Cute and tiny sterling silver guinea pig charm bead that fits most major brand European-style bracelets (like Pandora), necklaces and anklets. Guinea pig bead charm by Ohm. 3. Love this charm bracelet! It is custom made to your wrist size and comes with 9 charms (you can get fewer or more charms if you like). Handmade sterling silver guinea pig charm bracelet by Efsterling. 4. Adorable guinea pig art glass pendant necklace or keychain. Handmade by Pixie Whimsy. 5. Guinea pig charm necklace that can be customized to look like your pet! Handmade and hand painted pendant by California artist Lena of Tiny Lapki. 6. Guinea pig and carrot charm available as a necklace, keyring or earrings. All proceeds go to the Los Angeles Guinea Pig Rescue. Guinea pig charm. 7. Hand cast and hand finished 925 sterling silver guinea pig bracelet charm by Esquivel and Fees. 8. Sterling silver guinea pig necklace by McLaughlin Creations.